My VM is setup with two NICs, one using NAT, the other using Host-Only Networking. My VM is running a DNS server and I have manually added its local IP to the DNS tab on my Mac's System Preferences -> Network Settings page for each adapter. Overall, the setup works fine. From the HOST, I am able to browse the virtual-hosts I have on the VM as well as the internet. From the GUEST, I am able to access the internet to get package updates etc. Occasionally, after a some delay, the DNS record is restored without me having flushed the cache, but this not an acceptable workaround as the delay is unpredictable and can be quite long. 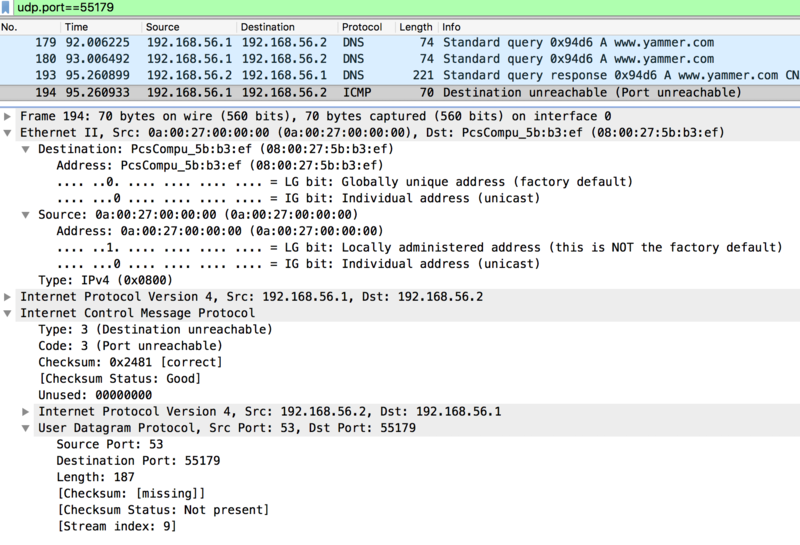 I have used Wireshark to try and track down the problem and, I think it has to do with mDNSResponder closing the port from which it made the DNS request to my DNS server before the DNS server was able to respond. This is evidenced by my Mac sending a Destination Unreachable (Port Unreachable) message to my DNS server on the port the DNS used to send its reply to the earlier request. The image below demonstrates the port closure problem (UDP port 55179). Note the timestamp of each packet. What is interesting is that the DNS request in the image had nothing to do with the mipal.int domain I'm having problems with. I suspect there is some sort of accounting problem within mDNSResponder. mipal.int mail is handled by 10 mail.mipal.int. mipal.int. 60  IN  NS  ns2.abms.int. mipal.int. 60  IN  NS  ns1.abms.int. Any advice on how to overcome this problem is welcome. 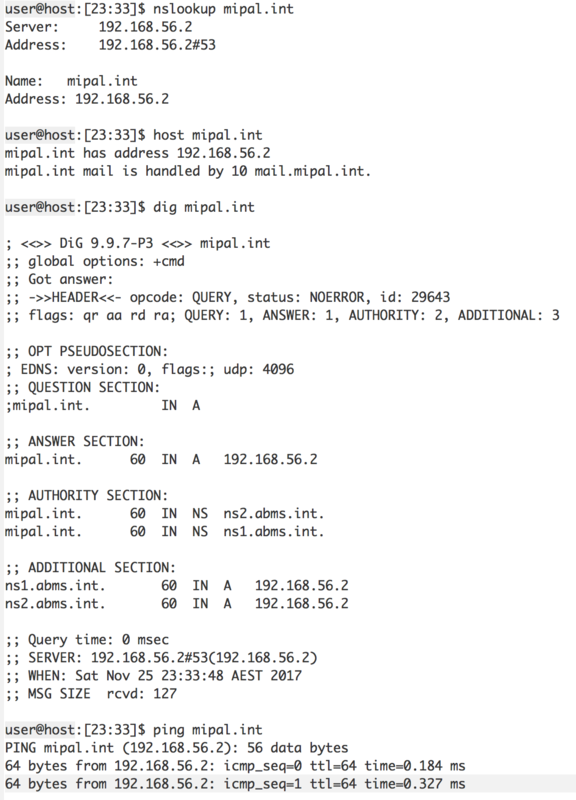 Browse other questions tagged network high-sierra dns virtualization . How to fix when I can nslookup and dig an internal hostname, but I cannot ping or ssh to the internal machine?